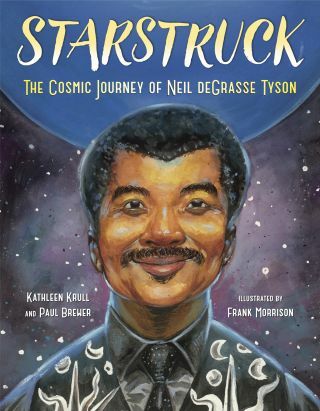 "Starstruck: The Cosmic Journey of Neil deGrasse Tyson" by Kathleen Krull and Paul Brewer, illustrated by Frank Morrison. What do you do when you're a self-described "fierce fan" of famed astrophysicist Neil deGrasse Tyson? Write a children's book about him, of course. That's what husband-and-wife duo Kathleen Krull and Paul Brewer did with "Starstruck: The Cosmic Journey of Neil deGrasse Tyson" (Crown Books for Young Readers, 2018), a new picture book that tells the real-life story of a young boy who gazed at the stars one night and never stopped looking up since then. A young Neil deGrasse Tyson is wowed by the Hayden Planetarium in a page from "Starstruck." Boiling down a person's nuanced life into a series of pages — particularly when he's still alive and kicking — might be a daunting experience for some authors. Krull and Brewer had their own moments of self-doubt and trepidation. But the "idea" of deGrasse Tyson, one of their heroes, Krull insisted, was "powerful enough for us to try to do him justice." When it came to figuring out how to untangle one person's manifold experiences into a cogent narrative, the couple modeled themselves after a master of the form. Neil deGrasse Tyson gets his first telescope in "Starstruck." "We love [deGrasse Tyson's] personality and sense of humor and also the way he can make complex science facts about space easier to understand for the TV viewer," Brewer said, referring to "Cosmos: A Spacetime Odyssey," a program that deGrasse Tyson hosts. (The show's latest season, "Cosmos: Possible Worlds," is coming in 2019.) "He's a genius at distilling information difficult for most of us to grasp. We wanted to try to capture his charisma in a book for children, to inspire them with a hero they should know about." Some of the things they uncovered about their subject surprised them. While deGrasse Tyson was a self-described "card-carrying nerd kid" who won science-fair prizes, for instance, he didn't always have his nose in an issue of Scientific American. "I was surprised at how big a part athletics played in his life," Krull said. "At the prestigious Bronx High School of Science, he wasn't just a science geek, but also captain of the wrestling team and a superb dancer." Later on, the collegiate deGrasse Tyson, as portrayed by the authors, "stretched his brain by inhaling physics, mastering equations and experimenting," but he also "stretched his muscles by wrestling, dancing and running up and down every single path through the seats at the campus stadium." Neil deGrasse Tyson at summer astronomy camp in the Mojave Desert in "Starstruck." Krull and Brewer make clear just how singular deGrasse Tyson's impact has been, and not just for science. Describing the day a TV station asked him to explain that day's news about a solar flare, they note how deGrasse Tyson is "jolted" by the realization that he had never seen a televised interview with a black person who was asked to lend their expertise about a subject that had nothing to do with being black. "The moment spurred his enthusiasm for becoming much more visible as a spokesman for science," Krull said. More than a biography, "Starstruck" is also an ode to the concept of empirical truth — something that Krull and Brewer wish to defend in today's conspiracy-theory-filled climate. "I would say that one of deGrasse Tyson's most powerful messages is for people to learn about science and accept the proven facts," Brewer enthused. "Just stop with the nonsense of spreading fake facts. The Earth is billions of years old, and it's round, not flat. Also, we did go and land on the moon — six times!"